Portofino Hotel ... soft launch in December. Kleindienst Group, the UAE’s largest European property developer and creator of The Heart of Europe, a cluster of six islands on The World project, has announced that it will soft launch its first hotel on Main Europe island – the Portofino Hotel – next month (December). This is the first five-star family-only hotel in the region and is a concept Kleindienst has imported from Europe, with every aspect tailored to a family’s needs. The first concrete was poured in January 2018 and the structure is now at complete. 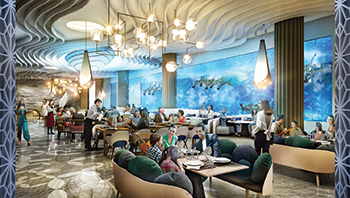 The Heart of Europe team is planning to scoop the Dubai record for the fastest hotel to soft launch less than a year after first construction commenced. More than 1,000 people are working on the site to ensure the property is delivered on time. The Portofino Hotel will offer 489 Princess suites including the exclusive Villa Adriana on the top floor, named after the famous Roman Emperor who is known for his influence on architecture across Europe. Guests will arrive at the hotel’s own fully-serviced private marina (known as Paraggi Bay), either by their own vessel or hotel-shuttle service and will be transported to the idyllic world of Portofino inspired by its Genoan counterpart, the tiny fishing village and summer playground of the rich in Italy. Portofino Hotel will provide magnificent facilities for the whole family. There will be five swimming pools, including a large pool – designed especially for water sports. For dining, there will be a choice of four restaurants and six bars. There are two infinity pools, one inside and one outside with views of Dubai and four islands offering treatments inspired by the natural elements of air, fire and water. Portofino Hotel is also conveniently located near the project’s climate-controlled streets covering 1 km, where it will snow and rain whilst maintaining a temperature of 27 degrees, 5 km per hour winds and 60 per cent humidity mirroring the climate in southern Europe during the summer.